Skye Bank Plc., has charged the Nigerian child to imbibe the savings culture early in life of to secure their future, even as it demonstrated its commitment to the development of the education recognised winners of its Skye Rainbow Essay Competition across the country and presented them with state-of-the-art educational tablets. The competition, which officially kicked off first week of April with call for entries across the six geopolitical zones of the country, saw 21 pupils emerge winners. 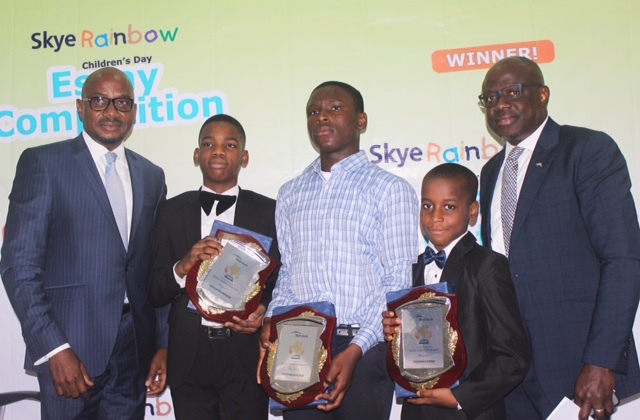 The ED congratulated the winners; Ajayi Samuel, Chiemeta Pascal and Chukwuebuka Michael and commended them for demonstrating unusual strength and brilliance. He also thanked their parents and teachers for standing by them till they emerged winners in the competition. On what motivated the competition, the top banker stated that the competition’s overall goal is to develop in the Nigerian child, creativity, good presentation skills and proper use of English, as a medium of communication. Also, it is intended to inculcate in the Nigerian child, a culture of appreciation for the positive parental influence over their lives in shaping their destiny. Mrs Ajayi Ololade, mother of Samuel Ajayi, the star prize winner, said she was very happy on hearing the news of her son’s emergence as a winner in the competition. “All my children have Rainbow account. I opened the account for Samuel when he was 3 years old. Now he is 12 years old. I set up a standing order instruction which has been making it easy for me to have funds whenever I need money for his education. The Bank’s new Digital banking Solution; SkyeXperience, makes it even easier to set-up standing instructions,” she said. On his part, the Directorate head, Lagos Business, Skye Bank Plc., Mr Segun Opeke, in a closing remark, commended the children for their achievement and challenged them to strive for excellence in all they do. “We are proud of you and we hope that as your future unfolds, we will hear more about you,” he added. The winners were later taken round on a tour of the operations and processes within a financial institution where they were taught a few things about how a bank functions. They were able to role play as bankers in customer service, bank tellering, credit and relationship management. Skye Bank is committed to the support of efforts aimed at improving the welfare of children; this commitment is expressed in the various financial solutions and inclusion initiatives undertaken by the bank, including the Skye Rainbow savings account, which promotes good savings culture among children. Skye Bank is Nigeria’s leading retail bank with wide-ranging electronic solutions promoting consumer lifestyle and e-commerce experience for its customers.